I have been tracking a particular WaMu Alt-A mortgage pool for a couple of months. The pool is known as WMALT 2007-0C1. About a week ago, by popular request, I did a February update in WaMu Alt-A Pool Revisited. I could have waited. March data is now available. The following screen shot is thanks to "YV". Note the above progression. 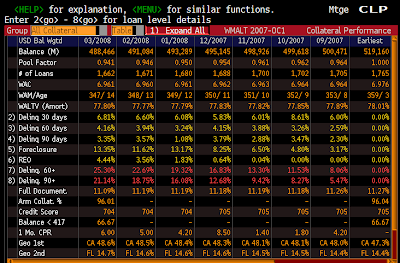 This cesspool from May of 2007, was 92.6% originally rated AAA, even though loans had full doc only 11% of the time. In less than one year, the pool was 25.3% 60-day delinquent or worse. Of that 25.3%, 13.35% is in foreclosure and 4.44% is bank owned real estate. MSN Money is reporting Moody's downgrades certain Lehman XS Alt-A deals. Moody's Investors Service has downgraded the ratings of 279 tranches from 27 Alt-A transactions issued by Lehman XS Trust Series. One hundred sixty two downgraded tranches remain on review for possible further downgrade. Additionally, 97 tranches were placed on review for possible downgrade. The ratings were downgraded, in general, based on higher than anticipated rates of delinquency, foreclosure, and REO in the underlying collateral relative to credit enhancement levels. This action is just a start. Expect far more downgrades in Alt-A mortgages. Prime mortgages will follow suit as well.